Apparently, nobody told Eichborn, a German publisher, which released hundreds of houseflies with ultralight banner ads glued to their hind ends. 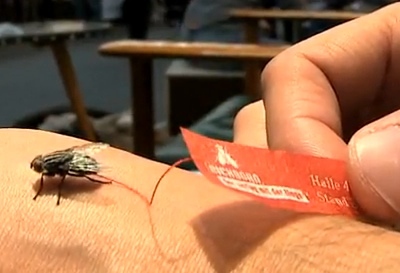 In the following video, attendees at the Frankfurt Book Fair are delighted by novelty. Just wait until there are millions of these. SF writer Jeff Noon also deserves a hat-tip for his blurbflies from his highly enjoyable 2000 novel Nymphomation.